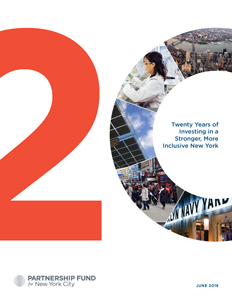 Partnership Fund for New York City: Twenty Years of Investing in a Stronger, More Inclusive New York outlines two decades of accomplishments by the $160 million civic fund that was established in 1997 and capitalized by corporate and individual contributions from the city’s business leaders. Highlights include job creation and launching significant new industry clusters in digital media, life sciences, fintech and other sectors of the innovation economy. invested in establishing the city’s innovation sectors including tech and life science startups and accelerators. Each year, hundreds of industry experts devote their time to the Fund’s sector advisory boards, investment evaluation teams and as judges and mentors for the Fund’s programs. Engaging leaders of the business community allows the Fund to identify and nurture the most promising emerging sectors and companies across the five boroughs. Two-thirds of the Fund’s investments have been dedicated to expanding opportunity, such as Hot Bread Kitchen’s East Harlem training programs for the baking industry; Grameen America’s microenterprise lending program; and shared industrial facilities developed by the nonprofit Greenpoint Manufacturing and Design Center. The other one-third have been catalytic investments in projects designed to stimulate growth and diversification in the city economy. 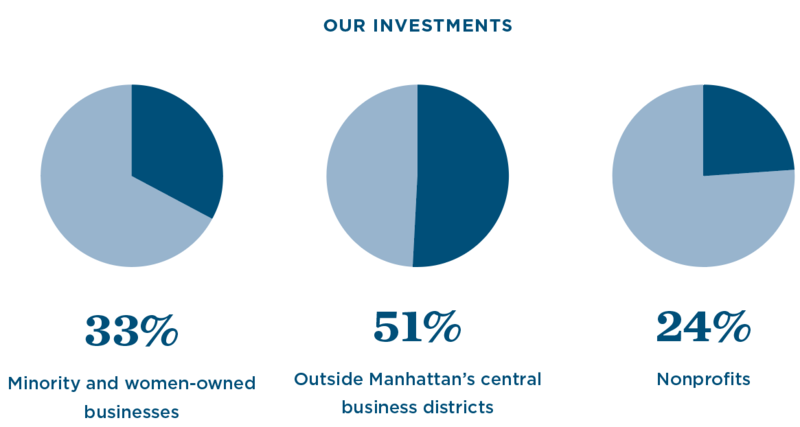 Investments are targeted at improving economic opportunities for all New Yorkers. By providing access to capital and leveraging public-private partnerships, we help reduce barriers to success in underserved communities. To catalyze economic development and the growth of new sectors, we target emerging industries and support entrepreneurship where there is otherwise relatively little private sector activity. As part of our effort to catalyze economic development, our FinTech Innovation Lab, New York Digital Health Innovation Lab, NYCSeed and BioAccelerate programs focus on the sectors that build on New York’s existing assets in academia, finance and health care. Thank you to the Fund’s investors, corporate and individual members of the Partnership for New York City who contributed at least $1 million and volunteer their expertise and other resources to support portfolio projects and companies. As an evergreen fund, all returns are reinvested in worthwhile projects and key growth sectors of the local economy. Please share our impact with your networks.